I think I was about 10 when I read Kenneth Grahame’s book The Wind in the Willows. It’s one of those classic children stories that never really leaves your head – a simple tale of friendship and adventure but told with so much heart and soul it just stays with you forever. I was curious to see the story of Ratty, Mole, Badger and Toad brought to life on stage. 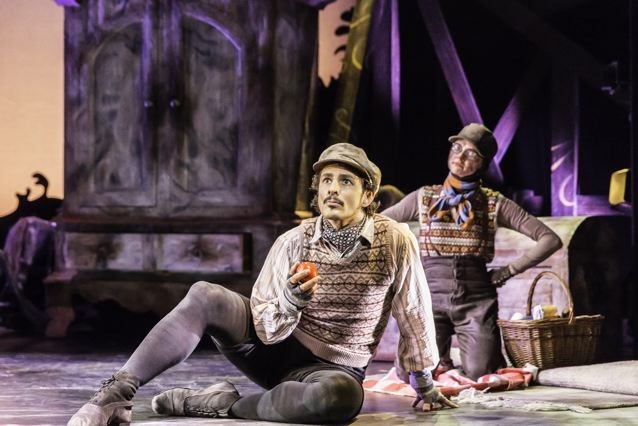 The Wind in the Willows is the Royal Opera House’s seasonal dance show – aimed at families with all the magical features you’d expect. There’s snow falling on the stalls, a chase through the auditorium with Toad finally being arrested in the Dress Circle bar, butterflies, a toy-like motorcar and a Narnia-like wardrobe (which leads to Toad’s gypsy caravan). 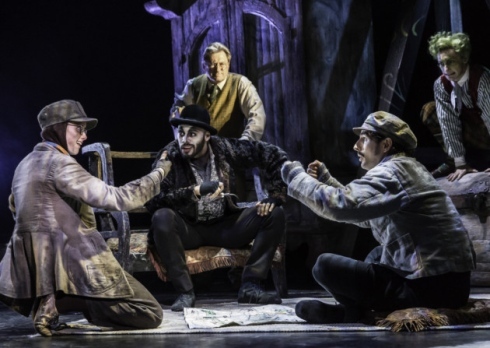 The story is told through dance accompanied by live music and narrated by Alan Titchmarsh as Kenneth Grahame – the imaginer (because “author” is too plain a word) of this fantasy world. Martin Harvey finally returns to the London stage to take on the part of the charming Ratty. His dancing is mesmerising and I’m sure his smile alone can melt hearts. It’s wonderful to have him back in the West End if only for a few weeks. Sonya Cullingford’s Mole is cute and nervous but will do anything to help his friends. And who would have thought it was possible to bring pure elegance to a dance routine while dressed in baggy trousers. It’s a joy to watch her on stage – simple as that. Ira Mandela Siobhan is wonderfully grumpy as Badger. He manages to show off both the aggressive and the protective side of Badger who doesn’t hesitate to go on a journey to help his friends in their battle against the weasels. Cris Penfold’s Toad has a childish delight in everything new. It’s hard to be mad at him for stealing a car and almost running over Badger when you see his wide grin and energetic dancing. A special mention has to go to Ewan Wardrop for his hilarious portrayal of both Chief “Elvis” Weasel and Gaoler’s Daughter – two parts that couldn’t be more different. This is a family show that is never cheesy. It has a bit of everything: Great live music that brings the story to life, likeable characters, some fabulous villains, wonderful choreography, puppets (because lets face it, we all love a little red weasel puppet), interval action and the most stunning cast. On top of that the sets and costumes are outstanding and really set the tone for this heart-warming show that’s cheerful all the way through. If you enjoy beautiful dancing and want to escape into a magical world The Wind in the Willows is the show for you. It’s a delight to follow Ratty, Mole, Badger and Toad on their adventures and not only children will leave the theatre with a big smile on their faces. 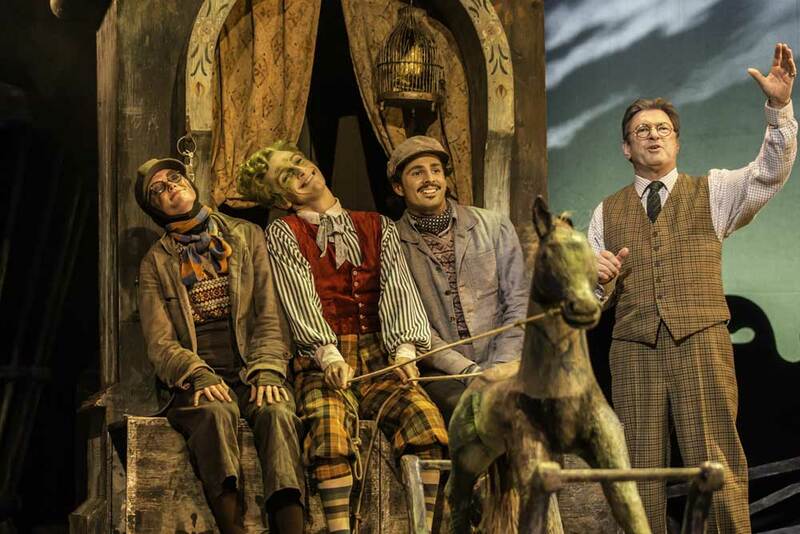 The Wind in the Willows is playing at the Vaudeville Theatre until 17th January 2015. For more info click here. Best available tickets can be found here.